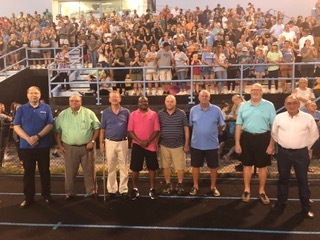 Boys of ’68 who attended the Gibbs High homecoming game: Thomas Miller, Ross Williford, Ernie DeZearn, John Anderson, Tom Fielden, Donnie LeCoultre, Aldredge Troutman, Mike Lively. Gibbs is a close-knit place, and family ties were in full evidence at last week’s homecoming festivities, which focused on the Boys of ’68. Jerry “Woody” Hutson, Class of 1970, is one of Gibbs’ most active alumni, and this year he applied his considerable energy to memorializing the 50th anniversary of the school’s re-entry into football in the fall of 1968. 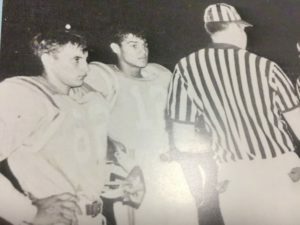 Although many think that was the school’s first football team, Gibbs had a team for many years before discontinuing it in 1958 for reasons that have gotten foggy over time. Hutson recalls that they went out with a bang, though, beating an unbeaten Halls team in the season finale. He appreciates the symmetry of winning their first game (32-7 over Harrison-Chilhowee) when they geared up again in 1968 with a rookie coach and a rookie team that played their “home” games at Halls High School because they didn’t have a football field. 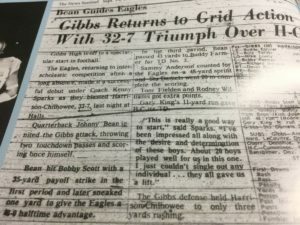 Gibbs High wins first game in 1968. The coach’s name was Ken Sparks, and the soon-to-be-legendary Carson-Newman Hall of Famer wasn’t much more than a boy himself that year. He was assisted by Richard Beeler. Sparks was only there for a year before moving along with his career. Hutson was a student his typing class. Sparks wasn’t the only outstanding member of the GHS faculty. Future superintendent Roy Mullins (himself a GHS valedictorian) taught chemistry. Future administrator Shirley Underwood taught English. Future University of Chattanooga band director Tony D’Andrea was the leader of the Eagles band. Captains Mike Fielden and John Bean wait for the coin toss. Unfortunately, the boys of ’68 went on to lose the rest of their games, but they sparked enthusiasm and school spirit. Anderson brothers Sam and William (then known as Sammy and Willie) would become standouts, as would their younger brothers John, James, Danny and Wendell. The quarterback was a senior, so he didn’t get another year, but he went on to a different kind of fame after his death in 1984. His name was John Bean, and he was a talented musician and a natural wit who bedeviled everyone he knew – and a lot of people he didn’t ­– with pranks calls and practical jokes that he recorded for his own entertainment. Eventually, his friend Marcus Shirley (who didn’t go to Gibbs) collected them and put them on cassettes that he distributed to family and friends. The term “viral” hadn’t been coined back then, but everybody who heard them wanted one of their own and there’s no way to know how many generations were spun off the originals, making Eddie’s Auto Parts and C&C Auto and Thom McAn household names, in some circles. Hutson and Bean were lifelong friends, and Hutson has become an archivist of Bean lore and memorabilia. Last Christmas he put together a book containing everything he could find that had ever been written about John Bean, from birth announcement to obituary. He produced 12 slim volumes and has given away 10 of them. The eleventh will go to the Gibbs High School library, at the request of Jeff Thomas, the Gibbs athletics director/assistant principal. Homecoming night was good. The Eagles beat Seymour 12-7 and Hutson set up a table next to the alumni association’s table and gave everyone who came through a blue cup that says Gibbs High School Foundation full of information courtesy of the New South Credit Union and the Class of 1970. He’s worked closely with foundation treasurer Richard Schulz, who was a classmate of Kenny Chesney and his manager, David Farmer. He was pleased when Tom Fielden (Class of ’69 and one of the Boys of ’68) suggested they go together and buy four more bricks for the Foundation Walk in memory of Bob Farmer, Van Donahue, John Bean and Coach Sparks. Roy Mullins will put them in place. And finally, for anyone who doesn’t know, John Bean is my brother. As I said, everybody’s connected out there.